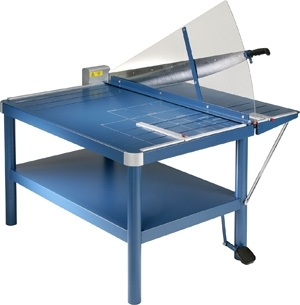 The DAHLE 'Safety First' workshop guillotines are fully equipped for large format work. The foot operated clamp makes it easy for large drawings, sheets of art board or packaging grade materials to be quickly and accurately set up for cutting. Industrial size guillotine equipped to handle large format work. Foot clamp holds material securely. Sturdy metal base with pre-printed guides. Self sharpening blade made of Solingen Steel. Acrylic safety guard. Adjustable backstop. Lockable blade to prevent injury. Equipped with a fold-up "cut-off" shelf. 43" Cut, 30 sheet capacity, 53" x 31" table size. Expect one week additional lead time for this product.